Smart DVD Creator 15.4: Easily burn quality home movie DVDs, VCDs or SVCDs from popular video formats. 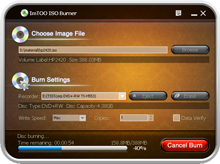 Soft4Boost Burning Studio 5.6.1.257: Burn various data onto DVD/CD/Blu-Ray discs with Soft4Boost Burning Studio. Smart PDF Creator 14.4: You can batch convert all your printable documents to PDF format fast and easy. IconLover 5.45: Icon editor to make icons, manage icon collections. Made with love!